February 21st-27th is National Eating Disorder Awareness Week 2016. This year’s theme centers on community responsibility, interpersonal connection, and support. These concepts are central themes in addressing and preventing sexual violence as well. We also know are there are a number of intersections between trauma and eating disorders. The way we respond to disclosures of trauma and eating disorders and care for those in our lives can have an incredible impact. While screening and awareness can save a life, sometimes cultural norms can cloud our ability to see unhealthy behaviors…even in ourselves! Dominant messages and understandings of health, fitness, and food can undermine what our bodies really need to keep us going. In attempts to create a self-care practice or establish time for ourselves, we may get caught up in these messages or become unable to see how our intentions have been manipulated. A recent podcast episode drew my attention to an emerging trend in eating disorders: orthorexia nervosa. Orthorexia is a preoccupation with healthy eating. “How is that bad?” you might be saying. Well, it’s a problem any time food preoccupies our thoughts, pulls us away from the ones we love, and/or prevents us from doing what brings us true joy. Diets or lifestyle changes that limit food – even to “healthy” foods – may lack nutrients our body needs to function at its best. Proper nutrition and wellness are about balance. Do your fitness or exercise activities feel like a healthy and joyful part of your life? Or are they framed as punishment or a way to control your body? Exercise is intended to be a way for us to keep our muscles and joints prepared for daily activity and longevity. Aerobic exercise, lifting weights, or participating in sports or group classes should be appropriate for your age, ability, and any medical concerns and focus on feeling alive, connected, and joyful. What language is being used in discussions of food? Food does not carry value or power. People assign those things with phrases like, “I was so bad this weekend…” and “I can treat myself for being so good this week.” Food powers our bodies and meals have historically brought us together as communities and families. Help coworkers, family members, friends, and children avoid this trap by celebrating food through preparation and meal-sharing. There is help available if you want to reach out for help or to support someone you care about. 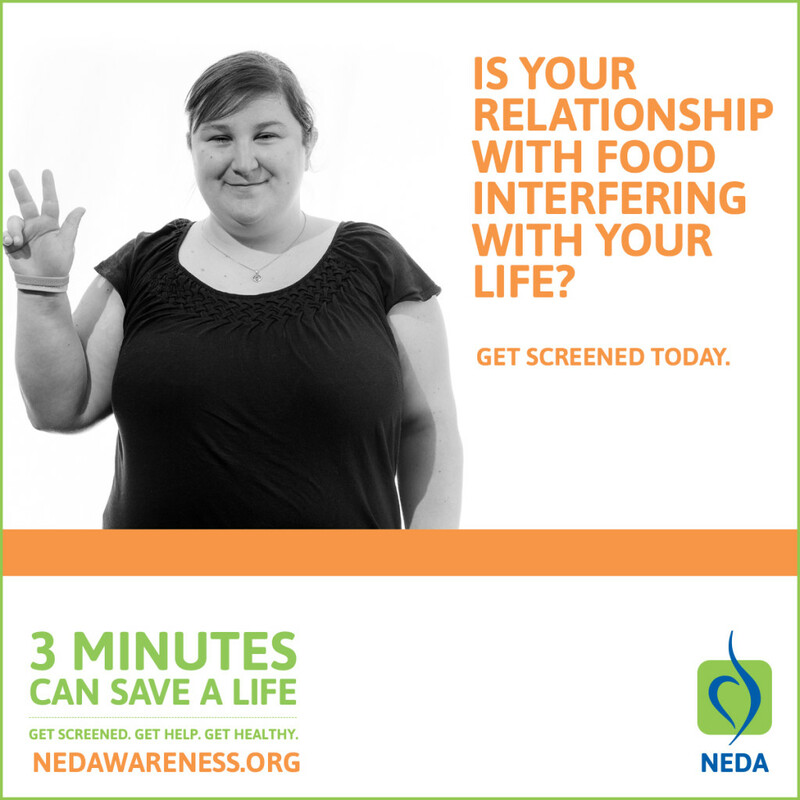 NEDA runs a national information and referral hotline at 1-800-931-2237. You can also visit their website for a live chat and more information. Liz Zadnik is NJCASA’s Statewide Capacity Manager. She supports training, technical assistance, and research efforts with local sexual violence programs and allied professionals. Liz is passionate about self-care and wellness; she is dedicated to raising awareness about the intersections between disordered eating behaviors, eating disorders, and trauma.